Scientists at the University of Liverpool and the Royal Liverpool University Hospital have completed human trials on a drug that has proved successful in preventing the development of a rare bone disease. The drug, called nitisinone, was originally developed as a weedkiller, but during toxicity testing it was revealed that it blocked the breakdown of an amino acid, called tyrosine, which plays a crucial role in the development of the genetic disease, alkaptonuria (AKU). Tyrosine is broken down in alkaptonuria patients, producing a substance called homogentisic acid (HGA), most of which is eliminated in the urine, but some is deposited as a black pigment in the body tissue where it is toxic. Nitisinone, however, can prevent tyrosine being broken down in the first place, blocking the production of HGA. AKU was the first human disorder that was recognised as a genetic disease 100 years ago, but is often mistaken for severe arthritis. The black pigment, called ochronosis, binds to bone, cartilage and skin, causing the eventual erosion of cartilage and the onset of osteoarthritis. Professor James Gallagher, from the University of Liverpool’s Institute of Ageing and Chronic Disease, said: “This is the first successful human trial of a potential treatment for AKU and we are excited by the results. The team believes that the work could also go some way to understanding the driving processes of ageing and more common degenerative diseases such as osteoarthritis. 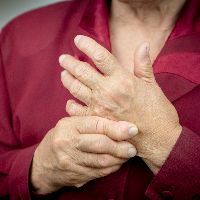 The research, led by Professor L Ranganath and including PhD student Andrew Hughes and Dr Anna Milan, is funded by EUFP7, is published in the journal, Annals of Rheumatic Disease.